"Peter and the Farm" is screening in the UICA Movie Theater until December 8, 2016. Throughout history, documentary filmmakers have given us the opportunity to get an inside look at some of the most compelling and interesting real-life characters. In 1976, we were introduced to the eccentric and odd relatives of Jackie Onassis in "Grey Gardens." In 1988, Errol Morris exposed that Randall Adams was wrongfully accused of murder in "The Thin Blue Line," and in 2005, Werner Herzog shared the life of Timothy Treadwell, a nature enthusiast who spent summers living among grizzly bears (who would later be mauled to death by the same bears he bunked with). 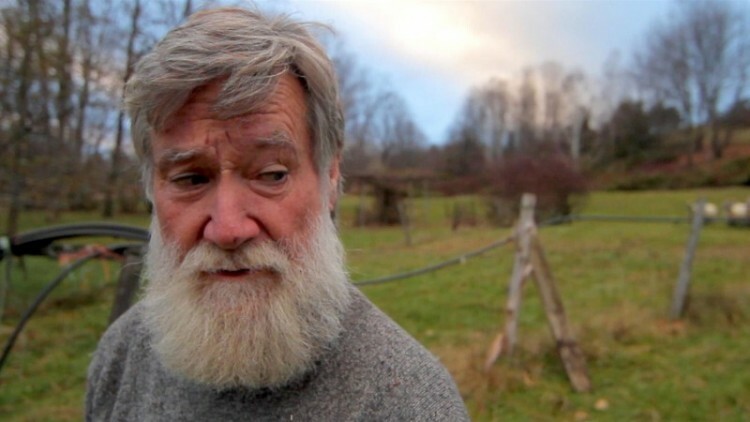 In the poignant documentary film, "Peter and the Farm" (2016), Director Tony Stone reveals the story of Peter Dunning, a suicidal, hard-drinking, organic farmer who claims that his love for his farm (and the livestock and animals on it) has cost him an inheritance, two marriages, and four children. The harrowing documentary presents us with subject matter and scenes that are both challenging and revealing. Within the first 20 minutes of the film (viewer be warned) we witness the slaughter of an ewe as Peter prepares the animal for his own consumption. It’s not an easy scene to stomach but, as difficult as this scene is to watch, it prepares us for the rest of the film and sets up a story that is impossible to turn away from. The real-life story of Peter Dunning’s life is perhaps more haunting than the scene previously described. Dunning recounts his youth, his dreams for the future that will never come to fruition, and the circumstances that led him to his beloved farm. Dunning, a failed artist whose past has greatly affected his present, still finds optimism in the every-day. In one particular scene, we see Dunning perched on a hill overlooking a grassy plain and in a moment that is almost poetic exclaims, “How could I ever be upset when I’m surrounded by all this beauty. I truly have it all”. This sentiment is a recurring theme in the stunning documentary and one, which I anticipate, we can all relate to. It’s no secret that I watch a lot of films and I have to say that Dunning is one of the best character studies I’ve seen in a long time. He’s a subject that you just can’t take your eyes off of and the Director, Tony Stone, has brilliantly captured a story that will resonate with all of us. I believe Dunning will go down in history (along with Edie and Edith of Grey Gardens) as one of the most eccentric characters ever documented.